A former Indiana State University interim provost who is the president of Wright State University will speak at a servant leadership seminar at ISU next month. David R. Hopkins, who has been president of Wright State since 2007, will deliver the keynote address at the Servant Leadership in Action seminar. The event, which will be from 11:30 a.m. to 4 p.m. on Nov. 7 in ISU's Federal Hall, will also feature panel and roundtable discussions. Panelists include Mel Burks, executive director of Hamilton Center, and Dottie King, president of St. Mary-of-the-Woods College, among others. "There is a correlation between servant leadership and community engagement," said Robert English, associate dean of ISU's College of Technology, who helped plan the conference. "They're based upon the same principles, and we want to provide that message because community engagement is who we are. It's our identity and our purpose." Hopkins formerly served as interim provost and dean of the Scott College of Business, and he also was senior associate vice president and chair of the department of physical education. He first served as provost of Wright State before becoming the university's president. 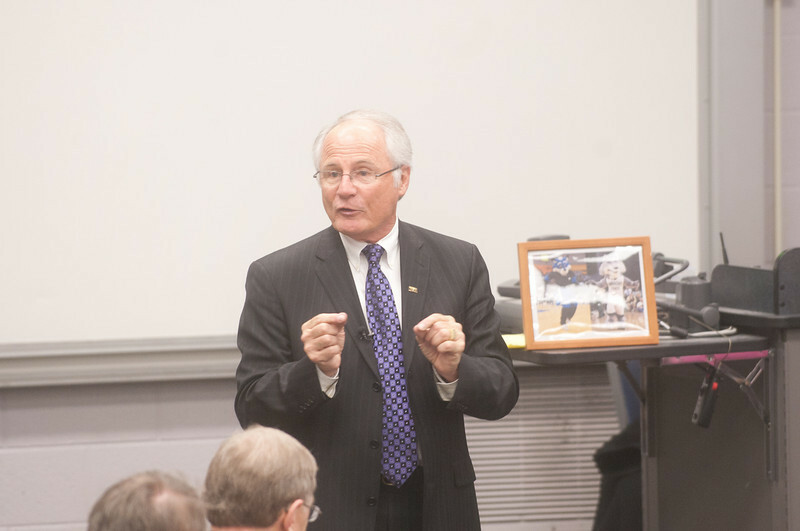 Hopkins has personified servant leadership during his career, English said. "Servant leadership is a philosophy of trying to help others, working collaboratively and listening to people and understanding what the problems are, then also working with other people to come up with solutions," English added. "It is a fun way of helping the world that you live in." Servant leadership is a form of leading that fosters collaboration and understanding consistent with the needs of the 21st century, said Rhonda Impink, associate professor of social work and a member of the committee organizing the seminar. "Servant leadership," seminar co-organizer and professor Dorothy Yaw said, "is about serving others before yourself." Wright State University president David R. Hopkins will be among the speakers at the Servant Leadership in Action seminar on Nov. 4. Hopkins worked at ISU before serving at Wright State.